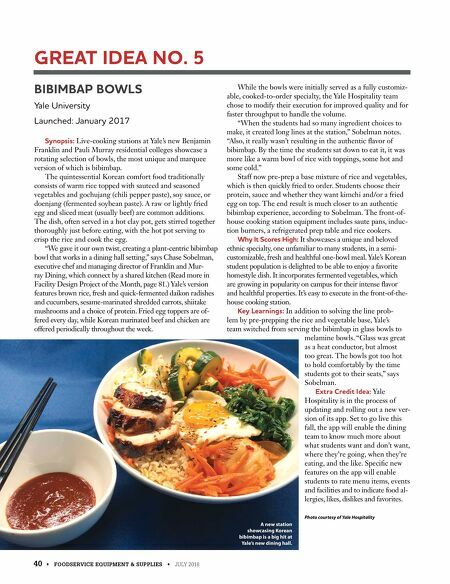 40 • FOODSERVICE EQUIPMENT & SUPPLIES • JULY 2018 BIBIMBAP BOWLS Yale University Launched: January 2017 Synopsis: Live-cooking stations at Yale's new Benjamin Franklin and Pauli Murray residential colleges showcase a rotating selection of bowls, the most unique and marquee version of which is bibimbap. The quintessential Korean comfort food traditionally consists of warm rice topped with sauteed and seasoned vegetables and gochujang (chili pepper paste), soy sauce, or doenjang (fermented soybean paste). A raw or lightly fried egg and sliced meat (usually beef) are common additions. The dish, often served in a hot clay pot, gets stirred together thoroughly just before eating, with the hot pot serving to crisp the rice and cook the egg. "We gave it our own twist, creating a plant-centric bibimbap bowl that works in a dining hall setting," says Chase Sobelman, executive chef and managing director of Franklin and Mur- ray Dining, which connect by a shared kitchen (Read more in Facility Design Project of the Month, page 81.) Yale's version features brown rice, fresh and quick-fermented daikon radishes and cucumbers, sesame-marinated shredded carrots, shiitake mushrooms and a choice of protein. Fried egg toppers are of- fered every day, while Korean marinated beef and chicken are offered periodically throughout the week. While the bowls were initially served as a fully customiz- able, cooked-to-order specialty, the Yale Hospitality team chose to modify their execution for improved quality and for faster throughput to handle the volume. "When the students had so many ingredient choices to make, it created long lines at the station," Sobelman notes. "Also, it really wasn't resulting in the authentic flavor of bibimbap. By the time the students sat down to eat it, it was more like a warm bowl of rice with toppings, some hot and some cold." Staff now pre-prep a base mixture of rice and vegetables, which is then quickly fried to order. Students choose their protein, sauce and whether they want kimchi and/or a fried egg on top. The end result is much closer to an authentic bibimbap experience, according to Sobelman. 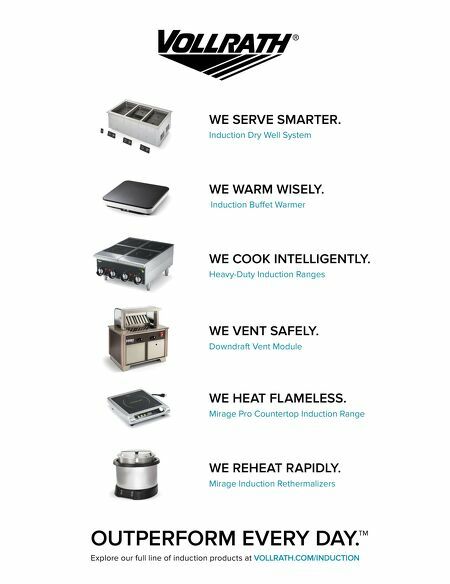 The front-of- house cooking station equipment includes saute pans, induc- tion burners, a refrigerated prep table and rice cookers. Why It Scores High: It showcases a unique and beloved ethnic specialty, one unfamiliar to many students, in a semi- customizable, fresh and healthful one-bowl meal. Yale's Korean student population is delighted to be able to enjoy a favorite homestyle dish. It incorporates fermented vegetables, which are growing in popularity on campus for their intense flavor and healthful properties. It's easy to execute in the front-of-the- house cooking station. Key Learnings: In addition to solving the line prob- lem by pre-prepping the rice and vegetable base, Yale's team switched from serving the bibimbap in glass bowls to melamine bowls. "Glass was great as a heat conductor, but almost too great. The bowls got too hot to hold comfortably by the time students got to their seats," says Sobelman. Extra Credit Idea: Yale Hospitality is in the process of updating and rolling out a new ver- sion of its app. Set to go live this fall, the app will enable the dining team to know much more about what students want and don't want, where they're going, when they're eating, and the like. Specific new features on the app will enable students to rate menu items, events and facilities and to indicate food al- lergies, likes, dislikes and favorites. Photo courtesy of Yale Hospitality GREAT IDEA NO. 5 A new station showcasing Korean bibimbap is a big hit at Yale's new dining hall.